A two-year on-site food waste recycling trial at Ang Mo Kio Blk 628 Market and Tiong Bahru Market was launched by the National Environment Agency (NEA) on Thursday, to test the economic viability and operational feasibility of two different types of on-site food waste recycling systems. The systems are leased by NEA from two vendors – Eco Wiz (SG) and VRM Operations (Singapore), and the vendors would also be in-charge of maintaining the systems. The pilot trial is expected to conclude in Dec 2017. 18 May 2015 – The National Environment Agency (NEA) today called a tender for a two-year on-site food waste management pilot to be run at Tiong Bahru Market and Ang Mo Kio Block 628 Market. 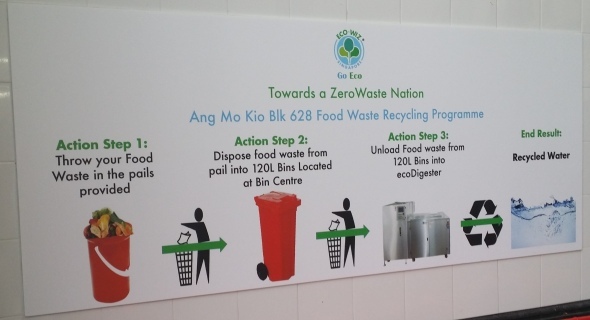 The pilot aims to test the economic viability and operational feasibility of food waste segregation and recycling in hawker centres, as part of government’s effort to move towards being a zero-waste nation. Food waste recycling machines will be placed at two of Singapore’s larger hawker centres in a two-year pilot, as part of the authorities’ overall efforts to curb the growing volume of food waste in Singapore. These machines are expected to reduce the volume of food waste at the hawker centre by at least 90 per cent each day. The National Environment Agency (NEA) called for a tender yesterday for vendors to supply the machines at Tiong Bahru Market and Ang Mo Kio Block 628 Market.